A fire can be very devastating with the loss of sentimental, often irreplaceable keepsakes and photos, along with being uprooted from your home and normal routine. That coupled with all that is required to fulfill your obligations of complex and sometimes confusing insurance policy, it is at this time that having an experienced team on your side looking out for your best interest is crucial. Along with cleaning and restoring your belongings we help you maximize your reimbursement by validating proof of ownership for items destroyed by fire or water (Total Loss Inventory). 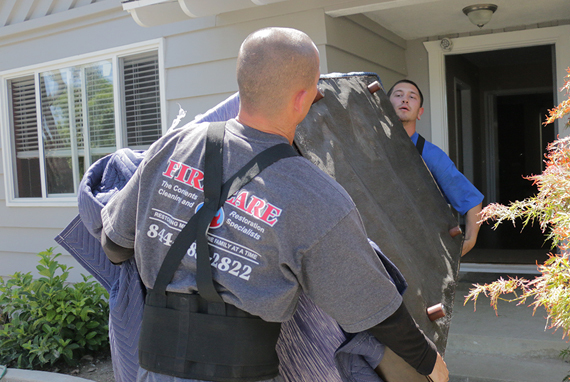 We will document all of your contents damaged beyond restoration increasing the money you will be compensated. Get life back to normal as quickly as possible. We had a house fire in our kitchen March 2015 and were displaced from our home until September 2015. During this tragic time, Fire Care from day one was extremely supportive and became our liason, friend, advisor, supporter and advocate. They were compassionate and understood the hardship, and emotional distress a fire can cause (no mater the size of the loss). They had a crew that were all kind, thoughtful, hardworking, professional and always made us feel comfortable about taking care of our belongings while we were in a rental home. If we ever needed something of ours in storage from thier facility, they immediatley located and delivered upon request. I could text, call, email and they would respond as if even my smallest of concerns or requests were important. I knew then, they would pull through for the big stuff. I hired Fire Care when I had some renovations done in my house due to some water damage. They were professional, courteous, prompt and handled all my furniture and valuables with the utmost care. Jessica and her crew were organized, efficient and carfully packed and inventoried all of my things so when they returned with my belongings, they knew exactly where everything belonged. I couldn't believe how quickly they were able to completely "Pack-in" my entire downstairs! All of my things were returned to me in perfect condition. They even washed all of my china and cleaned some of my soiled furniture! So, I got them back better than when they left! I would use them again if needed and would highly recommend them to anyone in need of their services.